Evolution of Visual Studio: The first version of VS(Visual Studio) was released in 1997, named as Visual Studio 97 having version number 5.0. The latest version of Visual Studio is 15.0 which was released on March 7, 2017. It is also termed as Visual Studio 2017. The supported .Net Framework Versions in latest Visual Studio is 3.5 to 4.7. Java was supported in old versions of Visual Studio but in latest version doesn’t provide any support for Java language. 2. Professional: It is the commercial edition of Visual Studio. It comes in Visual Studio 2010 and later versions. It provides the support for XML and XSLT editing and includes the tool like Server Explorer and integration with Microsoft SQL Server. Microsoft provides a free trial of this edition and after trial period user has to pay to continue using it. Its main purpose is to provide Flexibility(Professional developer tools for building any application type), Productivity(Powerful features such as CodeLens improve your team’s productivity), Collaboration(Agile project planning tools, charts etc.) and Subscriber benefits like Microsoft software, plus Azure, Pluralsight etc. 3. Enterprise: It is an integrated, end to end solution for teams of any size with the demanding quality and scale needs. Microsoft provides a 90-days free trial of this edition and after trial period user has to pay to continue using it. The main benefit of this edition is that it is highly scalable and deliver the high-quality software. First, you have to download and install the Visual Studio. For that, you can refer to Downloading and Installing Visual Studio 2017. Don’t forget to select .NET core workload during installation of VS 2017. If you forget then you have to modify the installation. Code Editor: Where the user will write code. Output Window: Here the Visual Studio shows the outputs, compiler warnings, error messages and debugging information. Solution Explorer: It shows the files on which the user is currently working. Properties: It will give the additional information and context about the selected parts of the current project. A user can also add windows as per requirement by choosing them from View menu. 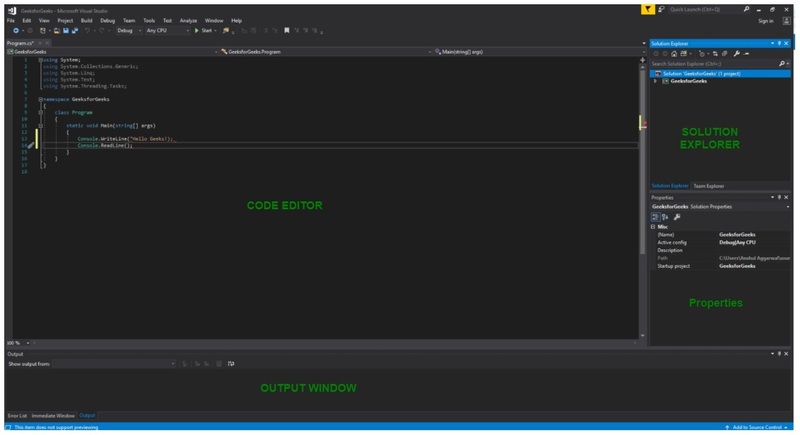 In Visual Studio the tool windows are customizable as a user can add more windows, remove the existing open one or can move windows around to best suit. Create, Open and save projects commands are contained by File menu. Searching, Modifying, Refactoring code commands are contained by the Edit menu. View Menu is used to open the additional tool windows in Visual Studio. Project menu is used to add some files and dependencies in the project. To change the settings, add functionality to Visual Studio via extensions, and access various Visual Studio tools can be used by using Tools menu. Support for different programming languages in Visual Studio is added by using a special VSPackage which is known as Language Service. When you will install the Visual Studio then the functionality which is coded as VSPackage will be available as Service. Visual Studio IDE provides the three different types of services known as SVsSolution, SVsUIShell, and SVsShell. SVsSolution service is used to provide the functionality to enumerate solutions and projects in Visual Studio. SVsUIShell service is used to provide User Interface functionality like toolbars, tabs etc. SvsShell service is used to deal with the registration of VSPackages.